"To be yourself in a world that is constantly trying to make you someone else is the greatest accomplishment." Ralph Waldo Emerson. And I completely agree. There are too many forces trying to shape us into the same things. We were all forced to go through the same schooling system; and now we are all forced to wake up the same time and work the same way. People don't expect you to make a career out of what you love doing for fun. Fun to them is going to cinemas, travelling to Dubai and partying with friends; anything outside of work. They think you are lying when you say you enjoy your work way more than those things. They are not used to making a career out of what they greatly enjoy doing. 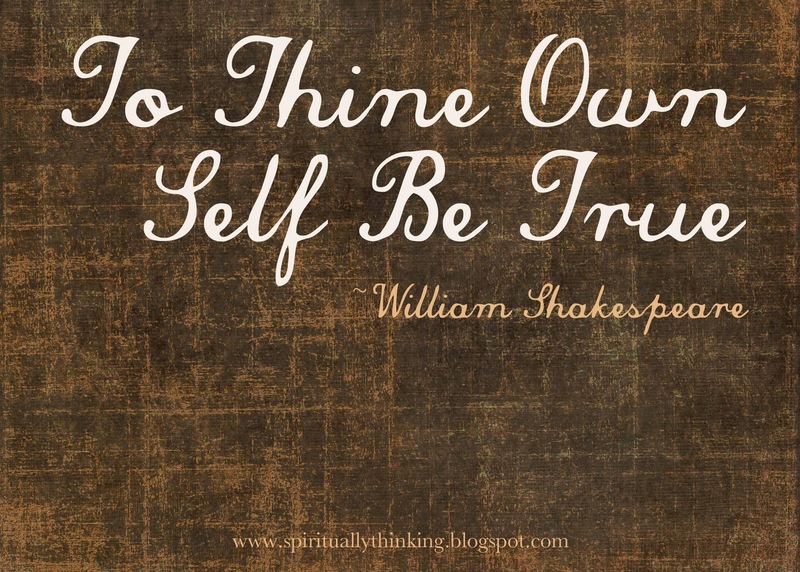 To thine own self be true. Stop trying to be like someone else or living up to someone else's expectations. Don't let other people or the society build for you the image of the ideal person to be. You are you and there is no one youer than you, and that is truer than true. (Dr Suess). It is not about being different just for the sake and bliss of being different. It is about letting the real you shine forth. It's about getting rid of those principles and ideologies that are sold in bestsellers. There are no 7 principles of highly effective people. There are no 10 rules of success. Everyone is meant to follow his own equilibrium path to success. A path that keeps every part of you in union and at equilibrium; not success at the sacrifice of yourself. For instance, I like working in bursts of few hours interlaced with sleep. I don't feel well when I work for 9 hours stretch, even with the one hour lunch break. I also work best when I am in the mood. I can get a high quality immense job done in 4 hours of being in the right mood than 2 days of not being in the right mood. So I spend a lot of time and money on bribing myself into the right mood and I don't force myself to work when I don't feel like working. I take my work like art, not something I do to put food on the table. I take up only projects I am happy working on and not the one with the biggest pay attached. It's not fun to work on something you don't enjoy. And I find out that the more I work on the very narrow spread of projects I enjoy, I become better faster and learn a lot I could use for something else. That is why I am constantly having some fun projects, both personal and paid projects. I also enjoy my work way more than hanging out with people or going to the cinema. So fun sometimes for me is simply working on those projects that make me smile in my sleep. I don't feel like I am slaving away or denying myself of a fun-filled life. Most days are fun-filled days for me. I am learning and growing at the things I enjoy, and making a good living from it. And I believe it is an evidence of being true to myself. "To thine own self be true, and it must follow, as the night the day, thou canst not then be false to any man." William Shakespeare.